The United States Federal Minimum Wage has not seen an increase since 2009. Many states and cities believe that too much time has passed since an increase and law makers are taking the matter into their own hands and are implementing increases that they believe are in the best interest of their citizens. Many high cost of living areas are moving toward an eventual $15.00 minimum wage. Even though most changes are set to take effect 1/1/2018, state legislatures may release the new posting requirements for these minimum wage updates anywhere from October to January. 2018 Labor Law Posters are now available to pre-order. 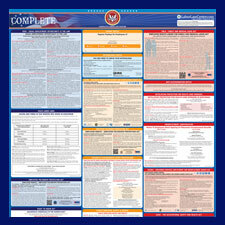 Pre-order today to get shipped a fully compliant 2018 labor law poster once released. LaborLawCenter™ is the premier labor law compliance company that’s been in the compliance business for over 15 years. We provide labor law posters and compliance services from small, single location businesses to large, multiple location corporations. Our federal, state and OSHA labor law posters are specifically designed to meet business needs and compliance requirements. Whether your company buys individual posters to ship to a single location or needs a year-round labor law poster service, Labor Law Center™ has you covered.